You don’t have to work 80 hour weeks, and skip food and sleep in order to be a successful entrepreneur. Kathryn McKinnon explains how successful entrepreneurs really handle their time! 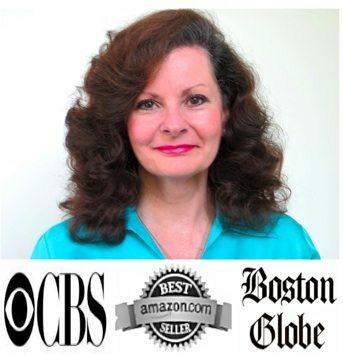 Highlights from her Keynote and Signature Training Program, 7 Time Management Best Practices of Highly Productive Leaders by Kathryn McKinnon, Harvard Business School Executive Coach, Time Management Expert, Speaker, Author and CEO of McKinnon & Company. Like most executives and professionals, you probably believe you don’t have enough time; however, did you know that within the last century, we’ve actually gained extra time? The emergence of many new technologies in all industries has created vast efficiencies in our productivity and reduced the amount of time and effort it takes to do many of our tasks and jobs. Add to this breakthroughs in healthcare that have increased our life expectancy to roughly 85 years, and the fact that it’s estimated that 1 in 9 baby boomers will live to be 100. So if you’re near retirement age, you may have another 30 years of productive life ahead of you! The reality is we’re gaining more time, not less. The issue is not whether we have enough time. The real issue is how we choose to spend the time we have. We all have the same 24 hours every day, yet some leaders are so much more productive with their time. Whether or not you believe you have enough time to get it all done, the simple truth is no one was born knowing how to manage time; time management is a skill anyone can learn! For over 20 years, I’ve coached and worked with hundreds of executives, leaders and business owners. I’ve also had the privilege of interviewing some of the most highly productive executives and business leaders to understand what makes them so productive. Today I’m sharing 7 of their Time Management Best Practices and productivity secrets. Highly Productive Leaders understand their thinking has an influence on their ability to get the best results with their time. When you allow your mind to be consumed with worry, doubt, fear, anger, guilt, petty grievances or resentment, you take your focus off your goals and don’t achieve as much as you want. You control your thoughts and how you spend your time. Focus on your goals, what you intend to accomplish and your success, versus your worries and potential failure. You’ll reach your goals faster and gain control over your time. Highly productive leaders are committed to making the most of every moment. They create a game plan to know where they’re going. They start each day the night before knowing their priorities for the following day. During the day, they pay attention to what’s stopping them from reaching their goals and what they need to do to take action and move the needle forward. They monitor the results they achieve with their time. By keeping track of how they spend their time, they determine when they’re off course and take steps to get back on track. Highly productive leaders review their daily priorities, choose the most urgent that will take the least amount of time and spend some time doing the fastest tasks on their priority list—a quick email response or phone call. They also stack meetings and activities to prevent wasted time and to increase their productivity. These leaders don’t live in their in-box. They do email following my 6-12-6 Rule, scheduling blocks of time in the morning, mid-day and at days’ end. One of my clients was spending 4 hours a day on email and couldn’t get his most important work done. After analyzing the way he was spending his time, we discovered 60% of the email he was working on wasn’t related to his highest priorities. I taught him an easy email system incorporating the 6-12-6 Rule to help him do his email and accomplish his most important work. This simple change in his routine gained him 2 hours of productive time each day! Your ability to focus attention on a task is crucial for achieving goals. It’s no surprise attention spans have been decreasing over the past decade with the increase in external stimulation. According to statisticbrain.com, the average attention span of a healthy adult today is just 20 minutes! The most productive leaders stay focused on their goals by knowing their goals, prioritizing the most important and breaking large projects into smaller tasks to avoid procrastination and feeling overwhelmed by too much information. If you’re spending critical time doing tasks that are not related to your true priorities, you won’t get your best work done. To stay focused, do your most critical tasks while your mind is sharp and energy is high. You’ll end your day with a greater feeling of accomplishment. Instead of letting their day run their calendar, highly productive leaders consolidate all personal and professional activities and block time for each activity into one capture system. Most block time into 15 or 30-minute increments for the entire day to identify their real available time. This prevents double-booking or missed events and helps them stick to their calendar. Highly productive leaders know that if their time is worth $100 an hour, they shouldn’t be spending time doing minimum wage jobs. Calculate what your time is worth. It will open your eyes and make you think twice before taking on daily tasks and activities that aren’t worth your time. Throughout their day, highly productive leaders ask themselves if how they’re spending time is their priority or someone else’s. If it’s someone else’s, they know they need to set boundaries with their time and say “No.” When they need to focus without interruption, they create the discipline to tune out distractions and block out time to work on high priority projects. Highly productive leaders plan for interruptions and schedule time into their calendar for unanticipated urgent meetings, calls and emergencies during the day. The beauty of this is that the block of time becomes a bonus of free time if the day evolves without interruption. They take a holistic approach to managing their time and realize the importance of maintaining a healthy mind, body, spirit and emotional state. They take time to celebrate their successes, no matter how small, and they don’t take time for granted. If you commit to using one of these 7 Time Management Best Practices for at least 30 days, you’ll begin to create your own Time Management System. You’ll increase your productivity, solve your time management challenges and gain more time for your highest priorities and goals. 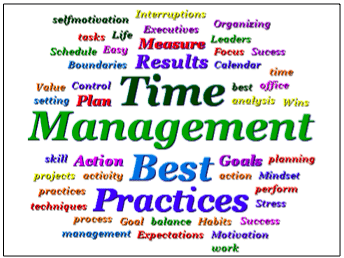 Make these Time Management Best Practices your new Time Management System to achieve the best results with your time. If you change the way you spend your time, you will change your life!